I can't believe that its Christmas week already?!? Where has the time gone?? I feel like I am up to my eyeballs in finishing some handmade Christmas presents, wrapping presents, cleaning the house, getting laundry done before we leave for the holiday, etc, etc. Please tell me I am not alone? 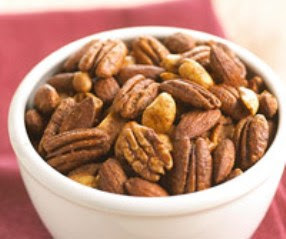 One of the things on my list is to make my Christmas Spiced Nuts. These are a favorite of everyone in my family and I always make a few extra jars to put in my Dad and Brothers stockings. Last year I just re-packaged them in their original containers- you can see those HERE. But this year I am using glass jars that I collected and covering the tops like I did in this little craft. Wrapped with a pretty ribbon and a nice tag, these are the perfect hostess gift or stocking stuffer. They look delicious...happily I am done with shopping and projects and ready to enjoy! Oh great idea with the nuts! I have a huge stack of cookies I want, but I doubt I'm going to get too them. I have loads of christmas gifts to die. I seriously want to cry! So much to do. Good luck in finishing everything up. I was running around like crazy yesterday trying to check things off my list! Ohh I must check out the recipe! I cannot believe it's Christmas on Friday...it really has gone by so quickly. 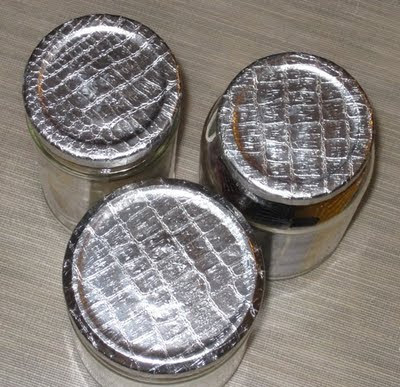 love those little jars! great idea. Yummy! Hope you saved some for me!